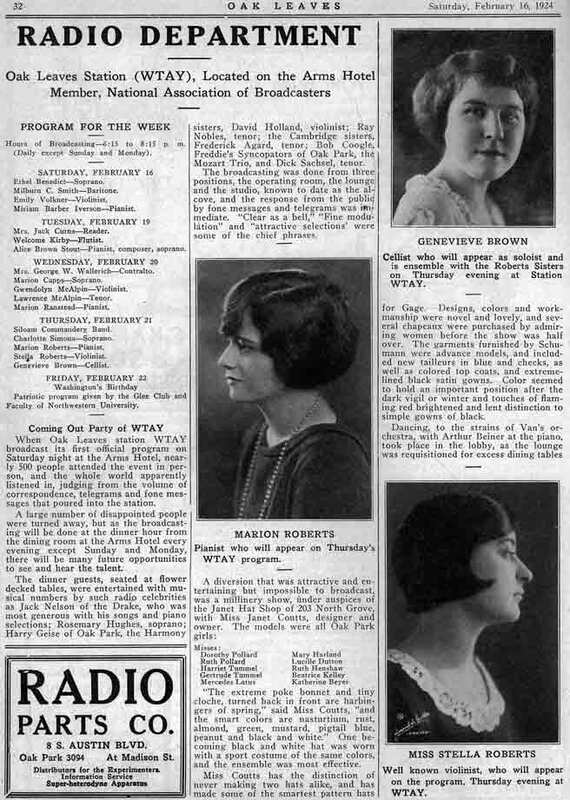 The station’s inaugural broadcast was preceded by a gala dinner in the Oak Park Arms ballroom that headlined Chicago radio celebrities from KYW and the Edgewater Beach Hotel’s WBEH. The public was invited, as the Oak Leaves put it, to “meet radio notables in the flesh.” In addition to live band music, local singers and musicians were encouraged to audition for a chance at on-air performances—an early local version of “American Idol”. For all its initial promise WTAY soon outgrew its local roots. In 1925 it was purchased by the Coyne Electrical Institute, renamed WGES, an acronym for Coyne’s motto: “the world’s greatest electrical school,” and moved to Chicago. Radio broadcasting returned to Oak Park and the Oak Park Arms Hotel in October 1950 with the launch of Village Broadcasting’s WOPA on both the AM and FM bands. For almost 30 years WOPA offered daytime popular music and nighttime jazz and rhythm and blues music. By the early 1970s the FM side, 102.7, evolved into Chicago’s WBMX, “the black music experience,” which became WVAZ in 1988. In 1987 ownership of the AM band (1490) was transferred to the Polish National Alliance and the call letters changed to WPNA. This Polish news and cultural station, along with WVAZ, continue to broadcast from the Oak Park Arms studio.